This matzo ball soup recipe combines mushrooms in the matzo and chiles into the broth for heat. We’re big proponents of not fixing that which ain’t broke, especially when it comes to cooking for the Jewish holidays. Grandmas and aunts can get a little wild if you tweak a classic recipe the wrong way. Thankfully, Chef Ivy Stark of Dos Caminos modified matzo ball soup, the Passover staple, in a way that’s so, so right. Using subtle Mexican flavors, Stark infuses the broth with chile, garlic and epazote (a sweet, mild Mexican herb) and adds mushrooms to the matzo balls. Ready to start your own Passover tradition? 1. Bring all ingredients to a simmer in a pot for 45 minutes. Season to taste with salt and ground black pepper and strain. 1.Heat the oil to a high heat in a large sauté pan. 2.Add in the mushrooms and sauté. 3.Add in the garlic and the shallots and cook until the mixture is dry. 4.Season with salt and pepper, stir in the epazote and remove from the heat to cool. 5.Place the matzo meal in a mixing bowl, add in the eggs and oil and stir in the mushroom mixture. Add in the seltzer and salt. Set aside for 10 minutes. 6.Bring water or stock to a boil in a large saucepan. 7.Using wet hands, roll the mixture into 1 1/2 ounce balls and drop into the boiling liquid one by one. 8.Cover the pot and reduce heat to a simmer. Cook undisturbed for 30 minutes. 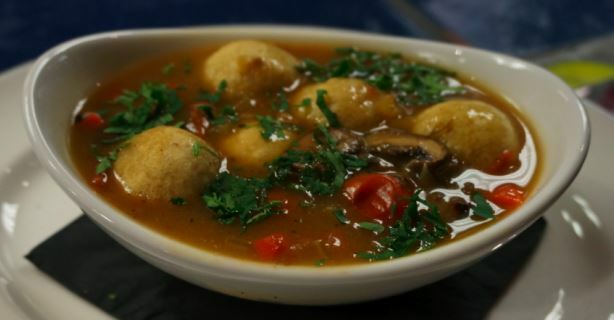 9.Remove the cooked balls from the liquid and cool, then return to the soup and serve hot.